These professional productions feature individuals who type or use letterboards to communicate. Several of the productions can be viewed for free by clicking on the icons below. This Peabody Award-winning documentary tells the story of DJ Savarese, a nonspeaking autistic young man who types to communicate. DJ graduated Phi Beta Kappa with a double major in Anthropology and Creative Writing from Oberlin College in 2017. The documentary covers DJ’s educational journey from being fully included in his local public high school in Iowa, to college in Ohio, and provides a window into his daily personal and emotional life. DJ starred in and co-directed the documentary to help promote access and inclusion for other nonspeaking individuals. It premiered on the PBS World Channel in fall 2017. Unspoken is a self-portrait of New York City-based autistic teenager Emma Zurcher-Long. Emma, who communicates by typing, co-directed the documentary and is a frequent presenter at national conferences. Her writing can be found at https://emmashopebook.com. Jordyn’s Rocky Journey is a documentary about the physical and mental work undertaken by a young man with autism to control his body and increase independence. Jordyn communicates by pointing to letters on a letterboard. He calls his out-of-control body “Rocky,” and writes of his struggles and work to gain control over Rocky on his blog of the same name: https://jordynsrockyjourney.wordpress.com/. Nina Vallado’s award-winning Sisterly is "a documentary film about sisters, autism and communication." It tells the story of Nina’s relationship with her sister Lisa, and Lisa’s path to communication. 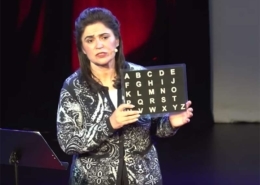 This TEDx Talk by award-winning veteran journalist Parisa Khosravi tells the story of her son Payam developing the ability to communicate effectively with a letterboard after years of trying other augmentative and alternative communication methods with no success. Parisa discusses the power of communication and how her relationship with Payam has deepened how that he has the ability to communicate. This Apple commercial, produced for Autism Acceptance Month in 2016, features Dillan Barmache, an autistic teenager who types to communicate and is fully included in his California public high school. Chammi Rajapatirana, "Hear Me Now"
Documentary filmmaker Gerardine Wurzburg documents the international travels of Tracy Thresher and Larry Bissonnette, two adult non-speaking autistics who type to communicate, highlighting the often hidden intelligence of many non-speaking autistics. Tracy and Larry share their own stories and meet with other non-speakers around the world who use AAC. This Academy Award-nominated documentary follows non-speaking autistic Sue Rubin, who was presumed intellectually disabled until she was introduced to facilitated communication at age 13. Sue was eventually placed in regular high school classes, and graduated from Whittier College in 2013, with a degree in Latin American History.